Samurai Jack is one of the best American cartoons out there. If we don’t count super hero shows like Justice League then it takes the title quite easily. The show had awesome fights and episodes that were nonstop action the entire time. It may have ended rather suddenly with no real ending, but that’s fine since you could always imagine your own ending. Still, everyone was rather hyped when they announced that the series would finally be getting a conclusion. Everyone…except me. From the start this was promoted as a far darker, grittier, more violent take on the classic show to fit in with the modern times. I had a bad feeling that this show was not just going to be bad, but terrible. Unfortunately…my fears turned out to be correct. This new season was fairly misleading as the first episode was actually really good. We got a nice fight scene and it was against a robot so there wasn’t any blood or anything. I felt like things would maybe be okay. Right after that is where the show went downhill and never recovered. Episodes 2-3 are the most action packed and intense episodes of the show, but are also overflowing with over the top violence. Jack also ends up murdering a few of his opponents who were brainwashed girls who were raised to despise him. The fact that they are rather young is there to increase the grit factor. Episode 4 was more like a classic Jack episode. It still couldn’t be bothered to avoid some animal violence, but was a big step up from the last two episodes. Episode 5 was the final episode before the show lost its focus. We see the Scotsman have a very pointless return as he gets one shotted by Aku and Jack is tricked into thinking that he murdered a bunch of kids. Honestly, I thought they were dead too so props to the show for not going down that rabbit hole. Episode 6 is about cameos as Ashi meets up with a bunch of old allies. You can say that it’s filler as it’s just a homage for old fans, but the good news is that this means we didn’t have to see any unnecessary grit. I think this may be the episode with a pretty wince worthy line, but more on that later. Episode 7 leads us back to grit as it’s one of the most violent episodes. Ashi murders a bunch of villains and you’ll just want to fast forward to the next one. Episode 8 is one of the worst episodes. This time it’s because of the very forced romance and the fact that it doesn’t work at all. Jack’s wayyyyyyy older than Ashi and as people had been pointing out on the sub reddit for weeks, it couldn’t work. The show surely wouldn’t go down that path right? Well, they did even though everyone was hoping for a more father-daughter bond which would have made more sense. Episode 9 still has some of this plot to deal with, but luckily the second half is better as Aku steps in. Episode 10 is extremely rushed with a rather lackluster ending and one of the more anticlimactic final fights. The season ended as it ran….a disappointing and unnecessary final season. Lets look at the negatives more generally now. First off is obviously the violence. Samurai Jack was originally a kid’s show, but this season decided to get extremely violent and dark. You could barely go a single episode without some kind of animal violence. Whether it be a bird getting stabbed, a dog being slashed to the verge of death, or random bugs squashed there was something always happening here. Animal violence is always a big no-no and having it show up over and over again certainly doesn’t help the show’s case. Naturally, the human fight scenes were just as bad. It gets to the point where you actively hope for an episode with no action and that’s where the show goes to the other extreme of having an episode that’s all about walking and talking. The only good fights are the one against Aku and robots, but those are typically quite brief. To make the show a little more dark as well, Jack destroys the brainwashed daughters of Aku as I mentioned earlier. They were only added to the show so that Jack could justify his choice to destroy them and so he could stop being such a dramatic hero who saved everyone in his path. This was their only purpose which meant that the writers didn’t even care about their power levels. They started out as being incredibly strong and much quicker than Jack, but ultimately turned into light weights that Jack could defeat with ease. The show’s writing also drops down quite a few levels. Just to keep up the edge factor the show has Scaramouche use a p word to describe someone’s head and it felt so out of place and unnecessary. It was about as forced as Wolverine’s catchphrase in virtually every X-Men film. The whole romance angle was also written quite poorly. Jack’s sudden lack of confidence and debates with his inner self were just as hard to watch. Aku was really the only character who stayed in character during this season. He was great and definitely a highlight here. Without him, I wonder how the show would have fared. To expand on why Jack isn’t a good character here, he has to compromise on his ideals far too often and doesn’t seem to have a shred of will power left. He decides to commit suicide after not being able to save a bunch of kids, but all that will do is doom even more people. He decides not to help a village that is being destroyed because he’s tired of being a hero. By the time he changes his mind and goes there, everyone is already dead. Jack even got a bunch of clever nicknames on Youtube as a result since he certainly seems to have gotten more ruthless over the years. His new (pretty bad) design didn’t help matters either. They really dropped the ball on this. While Jack may have been butchered as a character, he still got some pretty good lines during the season. “It always seems bad at first, but then I find a way” or “I will give you a new choice. Turn back now or stay and face your destiny.” Those may not be word for word, but they were pretty intense. The latter especially as it comes from the preview for one of the first episodes. It was the most exciting preview and easily one of the best Toonami previews of all time. The music for that one was also pretty awesome and it will make you wish for some good tunes in the actual show. Ashi is the main heroine and she’s a pretty decent character. She gets the short end of the stick on this show, but it was nice to finally have another supporting character who could fight. 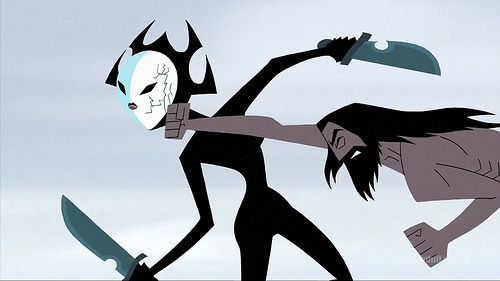 It’s a shame that we then had to throw romance into the picture and that we couldn’t see Ashi’s true form appear more. She was a good character and probably the best member in the series. She’s as brutal as Jack thanks to her origin and also mows everyone down during the course of the series. She got significantly weaker after turning good, but that’s to be expected. I like the concept of her character more than the execution, but she definitely wasn’t bad. Scaramouche was great in the first episode. He made for a really good villain and his tuning fork is a potent weapon. That being said, his character was wasted in the rest of his appearances. The show just didn’t know what to do with him. His voice really helped to sell the character if you ask me. I already talked about how great Aku was so I don’t really need to go into it. He was just on point and while the show made him a little too powerful, (Jack can only win with plot hax) it made for an interesting dynamic. Aku is evil, but he doesn’t seem like a mean guy compared to the other villains. It’s something that I wouldn’t mind more titles playing around with. To an extent, Fairy Tail did this with Zeref for a while, but then he suddenly became full psychotic while trying to convince people that he was a nice guy. The animation is basically the same as the old Jack show. It’s a little more streamlined and modern as the colors are sharper and the contrast works well. That being said, it’s still not my kind of animation and I wish they’d switch it to something more modern. The show looks very dated and I’ve seen 90’s shows that look a lot sharper. Just check out DBZ or Pokemon. The fight scenes are also a big step down from the old series. That one could have fights that lasted the entire episode and they happened multiple times. All of the fights in the 2nd half of the series are short and the first half felt long and intricate but also super violent and bloody. There isn’t really much of a soundtrack here. The classic Jack end theme is still around for most of the episodes which was pretty cool. I’m not really a fan of the theme song either. I typically don’t care for narration in my openings as it should just be illustrated through the lyrics and animation. If the show can’t do that, then it just needs to try again until it can pull this off. The show is only 10 episodes so you’ll be able to get through it in a breeze. I can’t say that there is any real replay value to be found here at all. It may help convince you to re watch the old series again though so that would definitely be a good side effect of watching this one. At the very least, Samurai Jack serves as a cautionary tale to other old cartoons that fans want to get a new season. Odds are that the new season won’t be able to live up to the original episodes and it’ll just throw mud onto your cherished memories. Before ending this review I should at least come up with one positive fro the show. It’s not a 0 so it’s not as if the show had 0 potential. What it did do well was establish a pretty apocalyptic atmosphere. It’s clear that Aku has won the war when the season picks up. Everything that I say here refers to the first 3 episodes by the way. The rest of the season became a complete trainwreck. 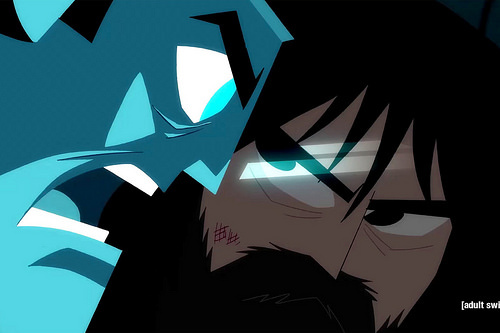 The episode with Ashi and Jack teaming up in the factory was the final episode to try and salvage itself. Still, the first 3 episodes were pretty hype. There was a nice level of intensity and flare to each episode and the fights had real stakes. While the daughters of Aku were nerfed, they still felt like a nice threat. Seeing Jack use a variety of weapons instead of his sword was also interesting since he is a master in virtually every form of combat. If the episodes had been handled in the same vein as the original show, I think that these three episodes could have easily reached a solid 9. It wasn’t to be, but at least Jack never got boring during this trilogy. It really should have come out as some kind of 70 minute movie. To address the ending, I can safely say that it wasn’t satisfying. As mentioned earlier, I wanted a big final fight. Even if we ignore the fact that we got cheated out of that, it’s just pretty mean spirited to Jack. The show basically just got him a companion just so they could take her away at the end so he could die alone. Jack also got over it a little too quickly in that last butterfly scene. I would have much preferred it if Jack had simply gone to the past, defeated Jack in a very long drawn out fight, and then became King. It would have been so much more effective and concise. That or have a big team up with Aku against a new villain, but I somehow feel like fans wouldn’t like that option very much. Overall, Samurai Jack deserved another season, but it didn’t need one. This season could have had a lot of potential since you can always make another story arc for Jack since he is immortal and the world is extremely large. Unfortunately this season couldn’t even decide what it wanted to do and half of the season felt like filler. The show could have ended on a more epic note after the first 3 episodes. It would have been a pretty conclusive ending. It even could have adapted episode 10 just without Ashi. Make no mistake, the show wouldn’t have gotten a positive score or anything since that would fix nothing, but you wouldn’t be missing out on anything by cutting the other 6 episodes out. The poorly constructed romance and pointless cameo of the Scotsman could have been left on the shelf. Next time you think about watching this show…don’t. This entry was posted in 3 Star TV Shows, Reviews, TV Show Reviews, TV Shows and tagged Action, Adult Swim, Aku, American, Animated, Ashi, Cartoon, Review, Samurai Jack, Sequel, Toonami, TV Show, TV Show Review by dreager1. Bookmark the permalink. 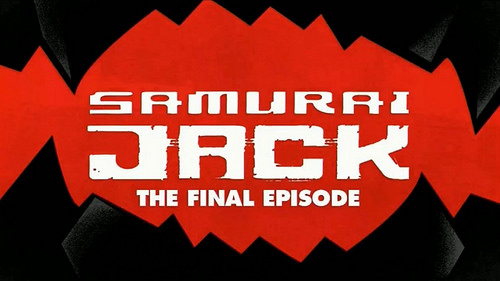 I didn’t watch the original Samurai Jack much, but I caught as much of the final season that I could. I enjoyed it, even the bittersweet ending, but I didn’t think much of it being too good or bad, probably because I had little to no prior knowledge about the series. If you enjoyed it, I’d highly recommend checking out the older seasons as well. Samurai Jack is definitely pretty engaging and I’m glad you enjoyed the final season. My main problem was with the violence above all so if you can get past that then I can absolutely see how it’s a good title.